Railpictures.ca - Cecil Hommerding, collection of Doug Leffler Photo: Lake Erie and Northern car 933 is shown coupled to two other cars at Port Dover station. The gentleman posed by 933 is a good friend of Mr. Hommerding, Jim Findlay of Hudson, Michigan, who attended the fantrip with Cecil and is seen snacking on an ice cream bar. Car 933 would be a “protect service” car that was kept at the Port Dover Station to cover any needs of service. Port Dover was the south end of the LE&N line that started at the GRR-LE&N Galt Main Street station and ran 51 miles south to Port Dover. The station was built in 1947 to a CPR Station Plan, at Chapman and Main Street, Milepost 51.0 of the LE&N. It was sold in 1965 to CN, who later sold it to the local town. Today it is leased to a private firm, owned by the Norfolk Region and still exists today (though not like it looks in this 1950 photo!). This series of photos were taken by a now-deceased friend, William Cecil Hommerding (who passed away in 1983). Another mutual (deceased) friend, Jim Findlay of Hudson, Michigan (pictured) accompanied Cecil on the trip. The Buffalo, Rochester and Syracuse chapters of the NHRS did each run several one day trips over the entire near 69 mile GRR-LE&N line around when these photos were taken, always on a Sunday. 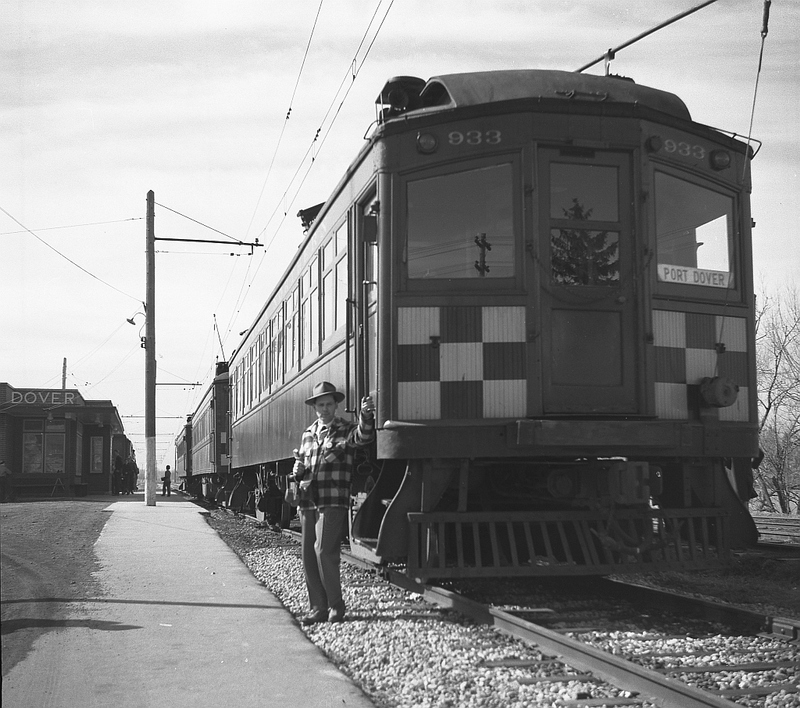 This particular trip was by a group from Michigan who held a one day, full length of the line trip on April 30th 1950 using GRR car 842, as pictured in many of Cecil’s images. Although both Cecil and Jim are now deceased, their photos live on! (* Editors note: we would like to thank Doug Leffler for sharing these excellent historical photographs of Cecil’s with us, and George Roth for helping interpret much of the historical and contextual information depicted in these photos.) Other photos from the fantrip: Car 842 crossing the bridge at Waterford: http://www.railpictures.ca/?attachment_id=10357 The fantrip at Kitchener: http://www.railpictures.ca/?attachment_id=10681 The GRR’s Preston Shops: http://www.railpictures.ca/?attachment_id=10413 For more details on Cecil, see here. | Railpictures.ca – Canadian Railway Photography – photographie ferroviaire Canadienne. Copyright Notice: This image ©Cecil Hommerding, collection of Doug Leffler all rights reserved. Caption: Lake Erie and Northern car 933 is shown coupled to two other cars at Port Dover station. The gentleman posed by 933 is a good friend of Mr. Hommerding, Jim Findlay of Hudson, Michigan, who attended the fantrip with Cecil and is seen snacking on an ice cream bar. Car 933 would be a “protect service” car that was kept at the Port Dover Station to cover any needs of service. Port Dover was the south end of the LE&N line that started at the GRR-LE&N Galt Main Street station and ran 51 miles south to Port Dover. The station was built in 1947 to a CPR Station Plan, at Chapman and Main Street, Milepost 51.0 of the LE&N. It was sold in 1965 to CN, who later sold it to the local town. Today it is leased to a private firm, owned by the Norfolk Region and still exists today (though not like it looks in this 1950 photo!). This series of photos were taken by a now-deceased friend, William Cecil Hommerding (who passed away in 1983). Another mutual (deceased) friend, Jim Findlay of Hudson, Michigan (pictured) accompanied Cecil on the trip. The Buffalo, Rochester and Syracuse chapters of the NHRS did each run several one day trips over the entire near 69 mile GRR-LE&N line around when these photos were taken, always on a Sunday. This particular trip was by a group from Michigan who held a one day, full length of the line trip on April 30th 1950 using GRR car 842, as pictured in many of Cecil's images. Although both Cecil and Jim are now deceased, their photos live on! For more details on Cecil, see here.